Please note: This is a preliminary release of linking functionality with À-la-carte. The parameters given here may change, in which case we will be sure to update this document and make an announcement on the main page. If you want to see any additional functionality or have questions, feel free to leave a comment. Linking through the Map URL option, feature name or Pleiades ID is the most straightforward process; however creating a json string is relatively easy and gives you many more options, including displaying multiple names or Pleiades IDs at once. All of these different procedures are explained bellow. Under the File menu in the map panel you will find a new option: Map URL. 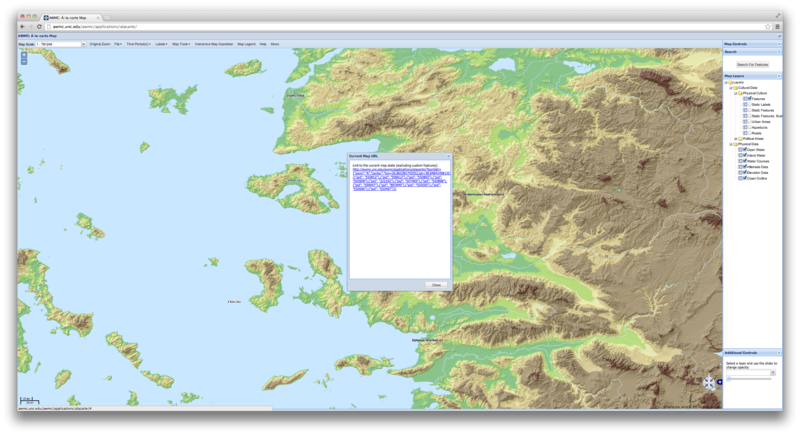 If you click on this link, a new window will appear zoomed and centered to your current map view. You can simply cut and paste this URL into your own site, which will allow visitors to interact with any map that you create. At the moment this only supports features that are in the Pleiades data set, so any customization will be lost (this is due to the fact that the URL generated will certainly become too large if we allow for customization of that kind). We are working on an alternative method for linking to maps using POST parameters, but for now this is an easy and quick way to generate customized map views for external websites. This parameter behaves exactly like the search function in the main application, so placing a partial name (i.e. pergam for Pergamum: http://awmc.unc.edu/awmc/applications/alacarte/?name=pergam) will return all places that have pergam in their name. Similarly, setting the parameter to Alexandria (http://awmc.unc.edu/awmc/applications/alacarte/?name=alexandria) will place all locations named Alexandria on the map. Note that, unlike the names parameter, the pid parameter will only return one feature. This is very useful if you only want to display a specific feature on the map. This option gives you the most control and flexibility when linking to À-la-carte, and is extremely useful for mapping existing projects. Do not be intimidated by the format, as .json is designed to be human readable and is easily modified. It is simply a formated list and is trivial to make from any source of names or Pleiades IDs. You will now see all of the places populated on the map. Once again, this behaves exactly like the search function on the map, so you may get multiple results for a single place name. This functionality is nearly identical to the names discussed above, although it uses different keys in the json string. You will now see all of the places populated on the map. You can use these parameters to link to a precise location and zoom level of your choosing. 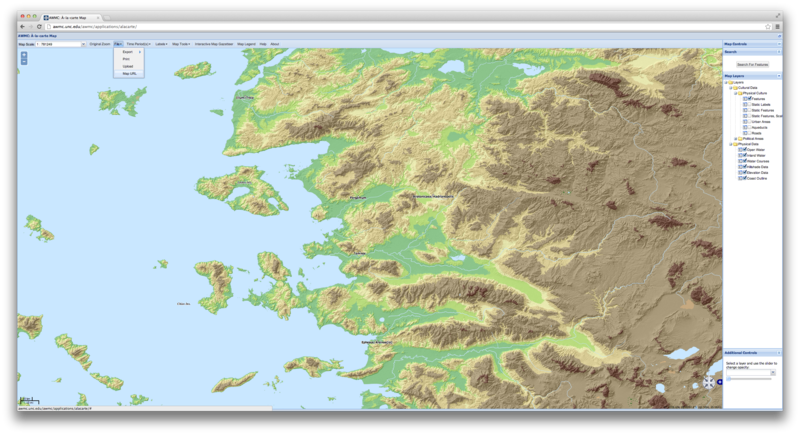 You will then see Athens placed on the map.